CSU Fullerton is excited to invite families to participate in a study investigating a parent-led physical activity program for children ages 4 to 7 years old with and without PWS. 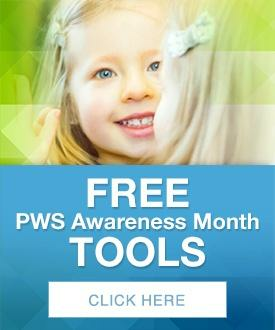 A child ages 4-7 years with or without PWS and one parent per family are invited to participate. Your family will be trained to do a 12-week home-based program with activities and games that stimulate the development of motor skills. You will receive all play materials and our curriculum of games at no cost. The study will require three short visits at CSUF and two playdates (one at CSUF and one at a location of the parent’s choosing). During the visits your child will have height and weight measured and will complete movement-related tests. Parents will complete questionnaires and a recorded interview. Children will receive a bag of toys ($10 value) and parents a $20 gift card following the first and last visit. Parents will be reimbursed for mileage (up to $40 round trip) for the visits to CSUF. For non-local families interested in participating, arrangements for travel expenses may be available (please inquire with our study staff). Families may keep the all the materials when the program is over.